has currently equipped, or what their class is. 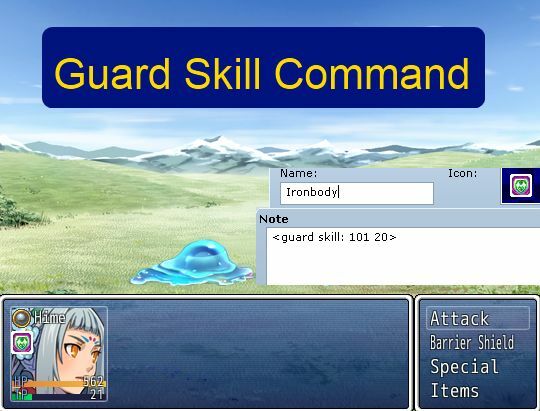 By default, the guard command uses the guard skill, which is the second skill. However, by adding a few simple tags and some priorities, you can customize what the guard command is. The guard skill can be specified as a number or a formula, allowing you to create dynamic guard skills. guard skill ID’s have equal priority, then whichever appears first is taken. no custom guard skills are defined. When the weapon is equipped, skill 20 becomes the guard command. However, if you then add the state, then skill 23 suddenly becomes the guard command because its priority is higher. Once the state wears off, the guard skill will return to being skill 20. For dynamic guard skills, you can use the extended note-tag to use a guard skill formula. For example, you can have different guard skills depending on your HP: if HP is less than 20%, then it will use skill 5. Otherwise, it will use skill 2. I was using this and noticed it didn’t work on states. I compared; the attack replacer does work. Defaults were the problem. Script has been updated. The solution your friend provided works as well. However it works when I put it on the class’s notes. What do? Funny enough it works on head and body, but doesn’t work on accesory nor shield. Also works on weapons. Hmm, that’s strange. Can you try it in a new project? Maybe there’s a compatibility issue somewhere.